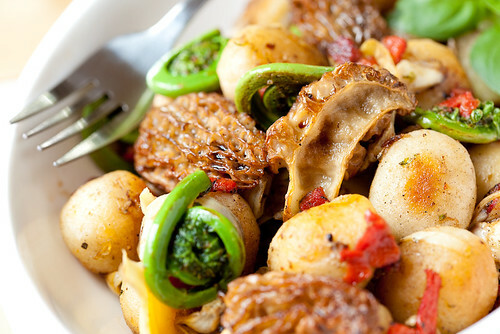 Spring is here, and it brings with it two of my most favorite seasonal items: morels and fiddlehead ferns. At $28/lb here in Boston, fresh morels are definitely a splurge. But you only need to pick up a few to have them in this dish, and it’s well worth it to do so. If you live in the right area, you can try your luck at finding your own in the woods right now, but as with all foraging, make sure you have the right mushroom before you eat it. 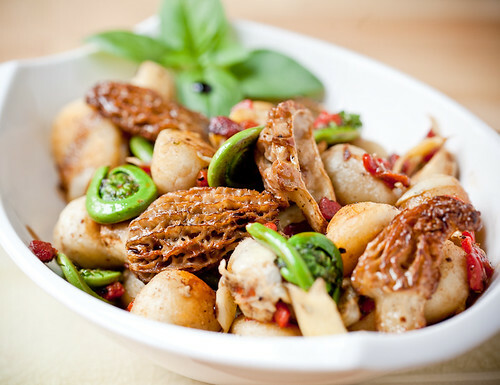 It’s best to go with someone who knows what they are doing, but the locations where wild morels grow are usually carefully guarded secrets, considering the price they’ll fetch at markets. It’s easier and safer to pony-up some cash at Whole Foods, even though it’s not as adventurous. Fiddlehead ferns are lovely. Not only are they in season at the same time morels are, they also pair really well with them. You can read a little informational post I wrote about them here. I love their tender crunch, mild flavor, and beautiful swirl. And just like morels, use them as soon as you can, they don’t store well. 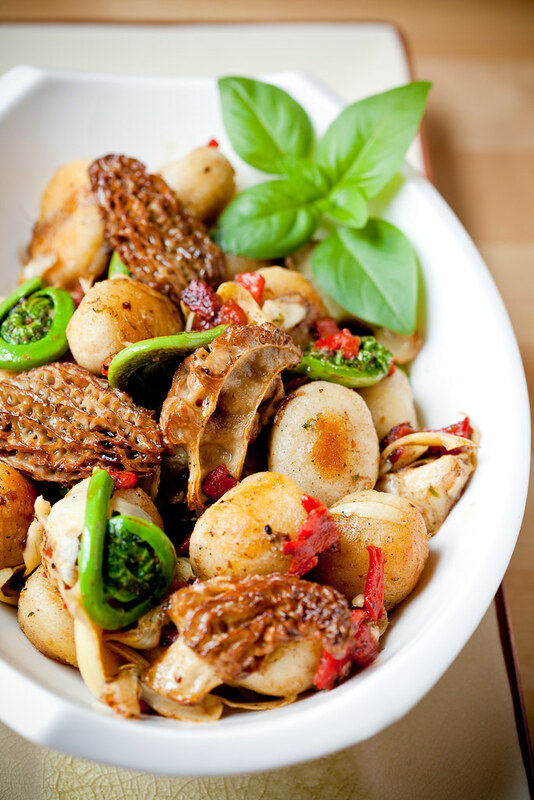 The hardest part of this dish is definitely finding the morels and the fiddleheads. After that, it’s cake! I used a pre-packaged fresh gnocchi (gluten free, too!) and further simplified it by pan-frying them instead of boiling them. Boiling is easy; pan-frying is even easier, not to mention faster. You can cook up the gnocchi faster than the time it takes to boil a pot of water. Pan-frying the gnocchi gives them a wonderful color and texture. If you’ve never tried it before, you definitely should! All the other ingredients are quick sauteed, so this makes a really delicious, fast, and easy meal with practically no fuss. And if you can’t find morels and fiddleheads, I encourage you to try the dish anyway with asparagus tips and your favorite mushroom. 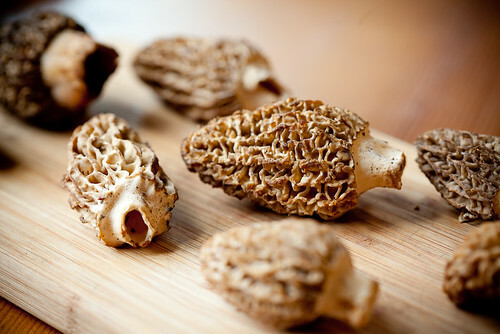 Slice your morels in half and inspect them carefully for dirt and critters. Since morels are foraged for in the wild, they sometimes have surprises hiding inside. Just saying. Heat a well-seasoned cast-iron skillet or non-stick pan over medium high heat. Add halved morels and a teaspoon or so of oil. Saute until golden brown, 2-3 minutes, adding a pinch of salt. Set aside. Add the ferns, roasted pepper, and artichoke hearts to the pan, with a teaspoon or so more oil if needed. Add 1/8 tsp salt to season. Saute for 2-3 minutes until tender and the artichoke hearts and ferns are beginning to color. Remove from pan and set aside. While the pan is still hot (medium-high heat), add the raw gnocchi and enough oil to coat well. Cook for 3-4 minutes until golden brown on all sides and slightly puffy. Once cooked through, add the fern/artichoke/pepper mixture back to the pan and toss gently until well combined. Season with more salt and pepper if needed. Plate, adding the cooked morel mushrooms to the top before serving. What amount of gnocchi are you using here? Looks delicious. Ooh, good catch! Sorry, I added the amount to the recipe! Morel mushrooms are my favorite! They are so goddamn tasty±This looks delicious! Pan-frying gnocchi sounds like a neat idea! I’ll have to give it a try. I think that this may actually be my ultimate dream dish… I just didn’t know that it existed until just now. WOW! Thank you so so much for sharing it! This sounds like an amazing recipe! I noticed the fiddleheads at Whole Foods the other day and was intrigued, but didn’t know what to do with them. I’ll definitely have to go back and get some! How interesting! I’ve never heard of fiddleheads but they sound delicious. This looks wonderful! I’ve been trying to decide on the perfect dish to use morels in and I do believe that this is the winner! I’m book marking this, especially since my mom and I go out and harvest Morels. Might bug her to gather some before I head home for the summer. ah fiddleheads are so adorable. it should be illegal. Thanks for putting the price of morels in perspective for me. Here they are $50 (yes, that’s fifty!) per pound. I decided that when we moved back to the Pacific Northwest that I’d start foraging and selling these delicacies for a living! So, I won’t be making this dish until we’re back there, but it will be the first Spring dish I make! Pan frying gnocchi is the best way to eat them!! Looks beautiful. Wonderful use of those ingredients! They look so beautiful too. I love gnocci, but have never thought of pan frying it! thanks for the tip. Wow, that look delicious! We’re moving to Boston in a couple of months, so I was especially excited to see this. I ve never tried morels . I m curious what they taste like. this dish is simply delicious ! I grew up in maine and would pick them every spring. I used asparagus instead, it was very good. This looks seriously fabulous! I’ve never seen fiddle heads in the store but … gonna look for them! But I have to say the the substitutes (any wild mushroom and asparagus tips) looks wonderful as well! Ooooh, fiddleheads! My uncle used to pick them wild and bring huge bags of them to our house. My (Greek) dad always sauteed them with olive oil, garlic and lemon juice. As an adult I seem to forget about them entirely from year to year, and then am happily surprised to see them in the store! Anyway, I am so making this, it looks like the perfect spring dinner! Yay! I just noticed the fiddleheads were in at in my local grocery store yesterday. Can’t wait to go home and cook them up. This sounds delicious. I’m actually salivating thinking about dinner tonight. Thanks for the recipe! Wow this looks so good! I never tried fiddleheads or morels. I can’t wait to try this combination! Morels: The most amazing mushrooms ever! Too bad these little flavourful ‘shrooms aren’t sold in Finland…hope they’ll pop up soon so that I can pick them up myself. Fiddleheads I haven’t tried yet, but this looks very delicious indeed. Thank you for the mouth-watering, hobbitness-inspiring post! where oh where do you obtain this gluten free gnocchi? i second #22 (courtney)…. This is awesome! I was just eating fiddleheads the other night…LOVE THEM. nice pics! If you cant find any in your area we always have em!! This sounds great and the pics look awesome, but I can’t find any gnocci that doesn’t have either egg or some kind of cheese? Any suggestions? During the final saute, i added a shot of whiskey and let it reduce down–the way it interacted with the potato created a rustic-tasting creamyness. amazing flavors! With morrels at $28/lb, I’ll consider myself lucky to live in Saskatchewan, Canada, where I can pick them in the forest in my backyard! Thank you for the delicious recipe! Thanks for this great recipe! It inspired me to try something similar using hop shoots instead of fiddleheads. An awesome meal for the return of spring. I live in Somerville and found some fiddleheads at Harvest in Central Square last night! I couldn’t find any morels so I picked up some trumpet mushrooms (http://en.wikipedia.org/wiki/Pleurotus_eryngii) at whole foods, and made this for lunch; I added some garlic to it as well. Really awesome – and it went over well with my boyfriend, too!